How is it October already? The first Monday of the month means that it is my turn to post a review on the Minerva Crafts Blogger Network, and this month I am happy to share with you a make that is a little different for me. 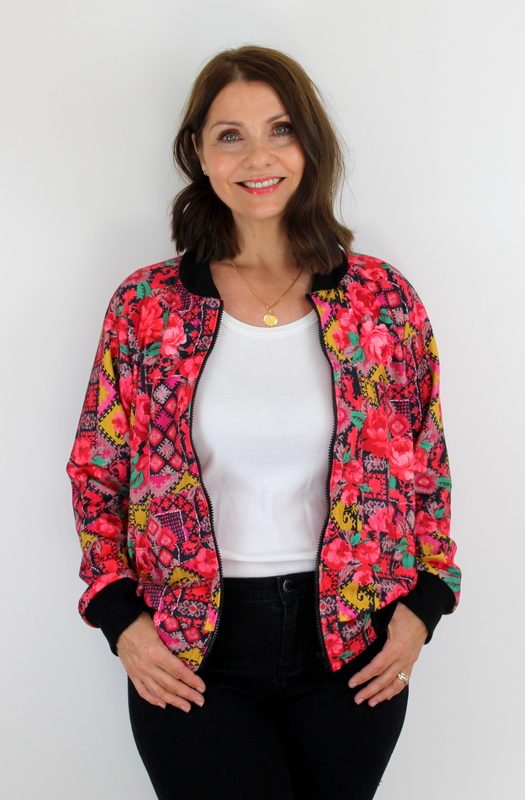 It’s the McCall’s M7100 bomber jacket (I might mention here that Minerva have 40% off McCall’s patterns at the time of writing this), and I made it up in this incredible red floral Ponte Roma fabric which is also currently on sale at £5.99 per metre at the moment. I won’t say too much over on my blog here, as you can read all about it over on the Blogger Network but I really enjoyed making this one and it is an incredibly quick and fun pattern to make – perfect for this time of the year! Thanks for stopping by, and I look forward to seeing you over at Minerva Crafts. The beginning of the month means that I get to share with you my latest make for Minerva Crafts. For those unfamiliar, Minerva Crafts is a large online fabric and haberdashery retailer in the U.K and every month I am lucky enough to have the opportunity to sew up something using their lovely fabric, and write about it over on their Blogger Network. 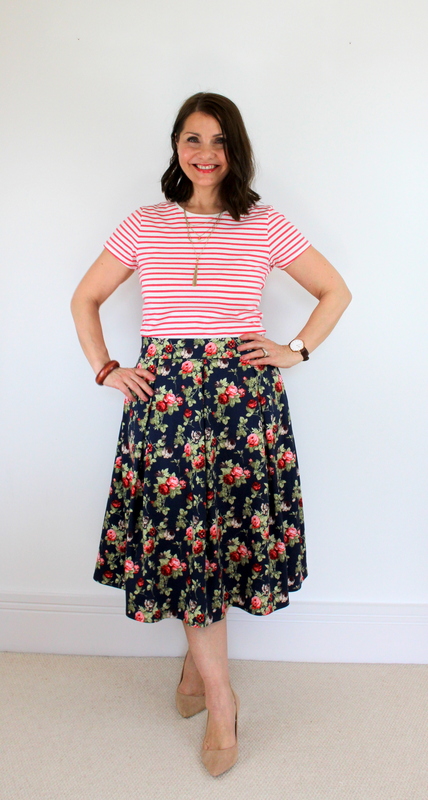 This month I chose to make this fab pleated skirt using a really great stretch cotton twill. Unfortunately, the navy colour way has now sold out (at the time of writing), but I had a look today and it is still available in a black which I will link to here. My full review is over on the Blogger Network now, where I share my thoughts along with more pics. This blog post may be a little shorter than the usual, as I have already written a full review on this pretty dress pattern back in June, which you can take a look at here. However I thought you may like to see another version of the dress that I made in a pink jersey. It happens to be another tropical print – I am all about the tropical print this Summer. I made this wearable toile as a ‘test run’ before I cut into the beautiful black jersey that I used in my June blog post. As it happens, this version turned out to be very wearable and I have worn it several times (as I have the black jersey version), it’s great! I learned when I made this that I needed to size down next time (which I did). This version was made in a size 14, and my black dress is a size 12 which is a much better fit. Worn with a belt, though, I feel it is still a dress that I reach for often, and receive lovely comments when I wear it – actually this applies to the black dress too – maybe this is the style for me! As I have said before, it is such a simple quick make. I love that you can throw it over your head and you’re good to go! No darts or zips, just a yard of elastic at the waist. Nice and simple. I have made a great deal of gathered and pleated dresses lately and this ‘fit and flare’ skater style is something that I have really fallen in love with. The skirt has just the right amount of ‘swishyness’ don’t you think? The fabric I used was a market stall bargain (£1 a metre from Leicester market)! and I bought so much that I have also made a jersey kimono from it which I blogged about here. Have you made the M7313 at all? I would love to hear your thoughts. I was very lucky to be given the choice of a couple of McCall sewing patterns recently as a prize from the lovely Kate and Rachel at The Fold Line. Thank you so much guys! If you haven’t already I would definitely take a look at their website. 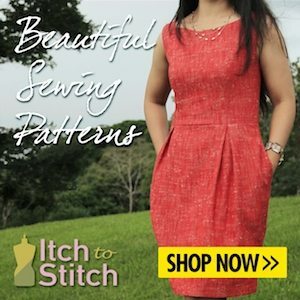 It’s a great place where all aspects of the sewing community are covered. New pattern releases, sewing news, meet-ups and pattern reviews and photos are available to browse through, and I would recommend signing up to their newsletters, they will certainly keep you on top of what’s happening in the sewing world! One of my pattern choices was this very simple dress which has an elasticated waist. Probably not the most exciting design but my reasons for choosing it is that it is a style that I reach for on sunny days when I want to wear a dress but don’t want to look too formal. As you might expect there are several variations – sleeveless, short sleeved, long sleeved and maxi length. I chose to use a fabric which I bought from Adam Ross Fabrics on a recent fabric meet-up with lots of sewing friends in Birmingham (#FMBHAM). 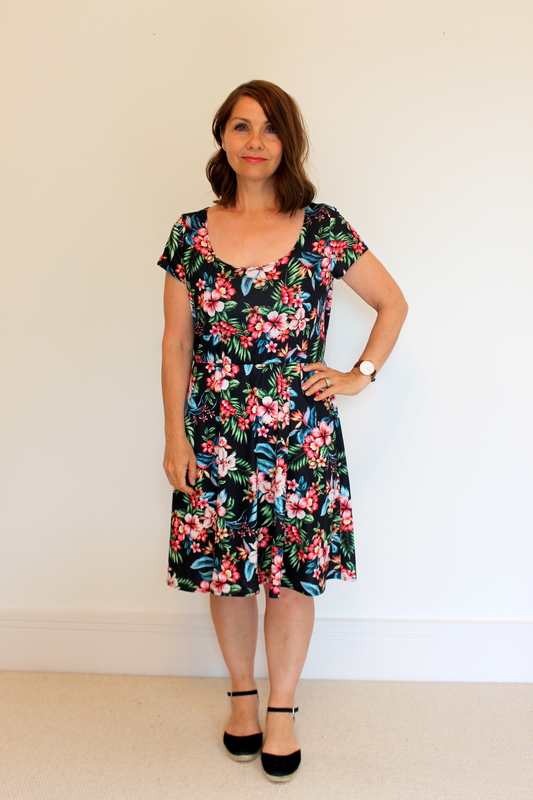 I think it is a polyester, and I love the colour, maybe not one that I would usually choose for a Summer dress, but I have so many florals in my wardrobe at the moment, it was good to have a change. Cutting out and the dress construction was easy peasy, you could almost do it with your eyes closed! 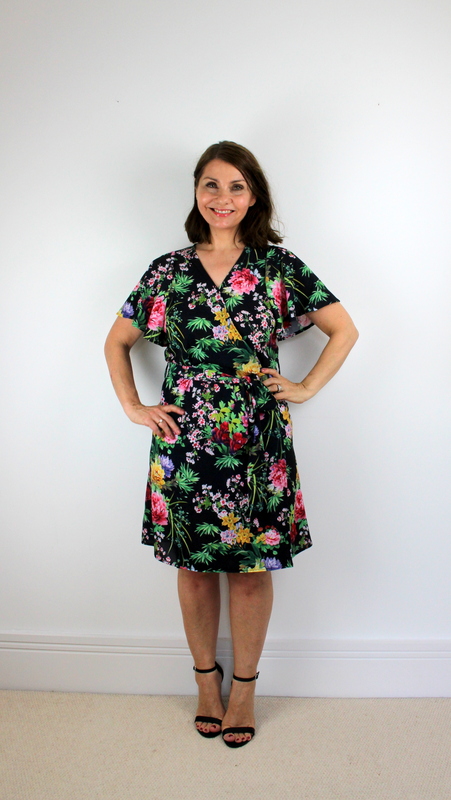 There are no darts, zips or buttons so this would be a perfect dress for an absolute beginner. Setting in the sleeves and the elasticated waist are the only challenges and these are very well explained by McCall’s with excellent written instructions and illustrations. The fit was good for me. Maybe the bodice of the dress was a little roomy, but I quite like this and it suits the design of the dress. Overall I feel it came up pretty true to size, often I end up taking more off the hem due to my height (or lack of it)! but this shows the true length of this skirt on a 5’2″ height. I did feel that it looked a little too plain on it’s own so added a belt and feel that this just gives it that little extra that I was looking for. I used one of these ‘elastic glides’ to help me thread my elastic at the waistband. So much quicker and easier than my previous method of using a safety pin attached to the end of the elastic! Obviously, I would have preferred the dress to have had pockets, you know me, so next time I will pop some in to the side seams of the skirt pieces, easy enough to do – I don’t know why I didn’t do it this time! So overall, a very quick satisfying dress make, and I am pleased with the outcome. I will make more of these for the Summer as I know it is a style that I enjoy for everyday wear. I rather like the idea of the sleeveless maxi dress option … how cute would that be with flat sandals on a sunny day! I do like using McCall patterns, I am always pleased with how they turn out. I really enjoyed sewing this up, and I have other McCall’s that I am planning to make soon, so will tell you all about them when they are done! If you enjoyed this, you may be interested in my thoughts on another McCall dress pattern, the M7381, and you can read about that here. Hope you have enjoyed reading my thoughts on this pattern.